When some donkeys – who should know better – get into the chicken pen, that doesn’t make them chickens. And if I write my Rubí Tuesday blog on a Wednesday that doesn’t make it a Wednesday blog. So this is my Tuesday blog on a Wednesday. A peasant in a chicken pen is not a chicken either. Our peasant is doing a very good job in this midsummer heat wave to keep the field clean and deliver the food on time. We are finally pleased to report he has stopped listening to news about Brexit from the UK and has become far more focused on cycling, after three weeks of the Tour de France. And Aitana still has mange, so we are keeping our distance from her. Silly horse! The peasant spends an hour every morning washing her with carbolic soap. Pure attention seeking, as far as I am concerned. Rubi, I think you might be getting a bit hot and bothered in the summer heat… Perhaps go and have a bit of calm in your cool and tranquil house? Yes quite. 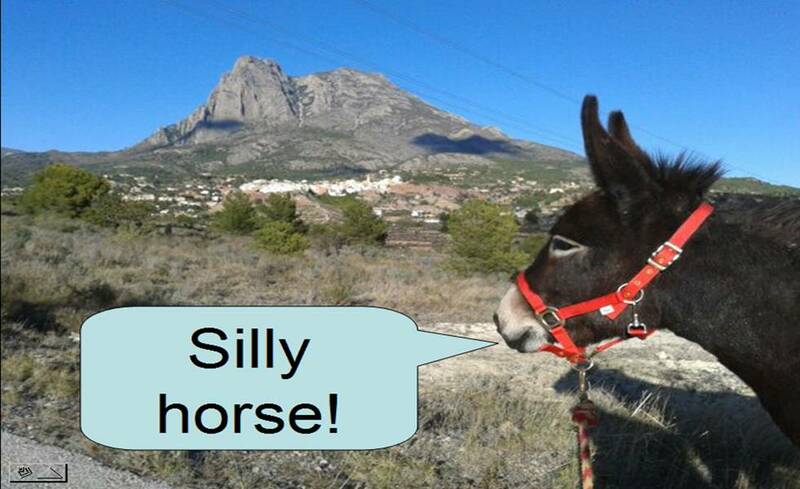 And I don’t know about “silly horse”… Who was eating poo yesterday, Rubí?